In this article, I will show you an example of Hibernate table per subclass inheritance model. In my previous article on hibernate inheritance model, I showed you example of Single table per class hierarchy strategy. We will be using MySql as our database. Single table per class hierarchy All the instances of a class hierarchy are stored in one table. Table per subclass one table per class. The superclass has a table and each subclass owns a table. The subclass table contains only the uninherited properties. Table per class Each table contains ll the properties of the concrete class and the properties inherited from its superclasses. In table-per-subclass mapping strategy, the parent and each subclass gets its own table. The concrete class state is a mix of the sub-class table and the table of superclass. The inherited state is retrieved by joining with the table of the superclass. Since the sub-class has its own table, there is no need of discriminator column. Each subclass must, however, declare a table column holding the object identifier. The primary key of this table is also a foreign key to the superclass table and described by the @PrimaryKeyJoinColumns or the element <key column="desktop_id"/>. The strategy attribute contains the InheritanceType. In our case it is InheritanceType.JOINED. Our example consists of an abstract class that represents hardware devices called Device. Desktop and Printer are concrete devices that extends Device. Both sub-classes have some additional properties apart from the inherited properties from Class Desktop. return "Desktop (" + getDeviceName() + "-" + getDeviceAddress() + "-"
return "Printer (" + getDeviceName() + "-" + getDeviceAddress() + "-"
Use <joined-subclass> element to define the subclass mapping. We need to make the primary key of the subclass inherit the superclass value. Use the <key> element to declare the primary key / foreign key column. Let’s test it out by creating a Printer and Desktop object. 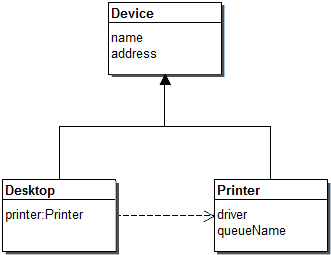 Hibernate: select printer0_.printer_id as id1_1_0_, printer0_1_.name as name2_1_0_, printer0_1_.device_address as device_a3_1_0_, printer0_.printer_driver as printer_2_2_0_, printer0_.queue_name as queue_na3_2_0_ from printer printer0_ inner join devices printer0_1_ on printer0_.printer_id=printer0_1_.id where printer0_.printer_id=? Each sub-class gets its own table. As you can see below, desktop and printer inherits the primary key value from the devices table. The primary key columns of sub-class tables also acts as the foreign key, joining the sub-class table and the superclass table. This was an example about hibernate joined sub-class inheritance strategy.